We have now moved, lock, stock and barrel to what has to be one of the most beautiful spots in this lovely country of ours. The Vale of Evesham, known for its fruit growing, big skies and long views across rolling countryside full of crops and grazing animals. Idyllic it sounds and truly Idyllic it is. A well kept secret! Our base may have changed but nothing else will. We will still be sourcing a variety of interesting items for gardens – antique and otherwise . We will still be exhibiting at the Chelsea Flower Show and the Hampton Court Flower Show and we will still be offering a very personal service of sourcing and delivering and placing of items. We hope to add the Malvern Garden Shows to our calendar. The Spring one and the Autumn one which we are still in time for this year and hope to be represented in a small way there on 29th and 30th September. We are still open, by appointment, for anyone who would like to come and view our current stock. All items currently in stock are on the website and to see them in the flesh you just need to call 01905 381679 or 07930 576881 to arrange to visit. All of the above make wonderful garden ornaments in all sorts of guises. There is often confusion when being presented with one of these stones as to what it is and what it has been used for. This can more often than not be sorted out when you look at how the stone has been worn and therefore what work it has been doing. The working and therefore worn edge of a cider mill stone, grindstone or sharpening stone will be around the outer rim and not on their flat sides as they work in a vertical position wheeling round on their outer rim. A millstone from a flour mill or similar will have been used horizonally and the wearing will be therefore on its flat side and the edges of one side. Often millstones have cut out grooves in their flat sides too. Worcestershire is well known for its fruit growing and I am looking forward to finding a really old stone cider mill here. As well as crushing fruit, nowadays these make wonderful ornaments in the garden or can be used for water fountains or for planting. Millstones from flour mills also look wonderful in a garden setting. Sometimes just propped up against the wall they ooze the working life that they have experienced in the stone, the smooth wearing of the edges and the colours and texture of the surface. We currently have a wonderful large millstone from Suffolk. This will make a great table/perch or if you set it just above the ground with water flowing through the middle and down over its rounded edges it will look wonderful. You can also have these large millstones mounted upright as a sculpture against the view. varying sizes down to the very little one shown here which is a little gem. You can make a great water feature with these by mounting them flat above the a reservoir of some sort or in the centre of a pool with water coming up the middle or you could use more than one – ever decreasing sizes with the little one on top having the water coming up and though. Little ones or narrower ones are lovely with a planted centre – herbs perhaps as the centre of your garden table – Thyme maybe. This is very special. In amazing condition for its many years. 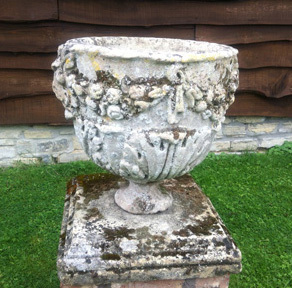 With fruit, vines and masks decorating it carved out of this very English limestone urn. It is reputed to have been at one time at the Houses of Parliament in London. I am yet to explore that bit of detail. It was however hand carved in the 1700’s by no doubt one of our top craftsmen of the time. It is secured onto a stepped square base and looks wonderful on top of a pedestal or wall or simply on the ground. We have a couple of really lovely stone benches at the moment. This being one of them. a very simple low bench made from a door sill/step - beautifully worn from footfall. Making a really lovely item. "Houses, like people, seldom keep their youthful lines. As they grow old and full of years they settle into comely shapes. Tiles have to be replaced and roofs grow wavy and irregular, patched with mosses. Steps and sills wear with use. Walls bulge, chimneys lean, beams sag, doors and windows sink out of alignment, but there is a comfortable and contented look about it all. Time creates an effect that no architect can produce even if he works with old materials, for Time alone makes the beauty of old age." A bit cheesey I know, but oh so true!! The show is at the Three Counties Showground, WR13 6NW if you fancy visiting. We hoping to be there with a selection of our stock. Visiting us at our base is by appointment only - please call before you come. We will do our best to be around when you want to visit but sometimes may not be able to be. We would hate you to have a wasted journey. Stone troughs are simply wonderful for plants or water as we know. They are however quite costly nowadays. When you are considering a large space where you want to have a container brimming with plants, please dont disregard the humble galvanised tank. 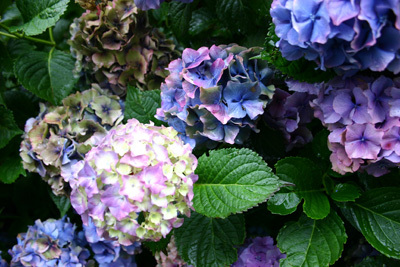 They look really gorgeous planted up as this one here and they are a much cheaper option for a larger trough. In the right place they are a great alternative. Watch this space – we have moved from a garden of 1/3 acre crammed with cottage garden plants and curving shapes to 2.25 acres of garden laid mostly to lawn.